The Wolff family lived at 90 Emmastraat. David was born in Meppel on 27 May 1887 as one of the five sons (Aaron, Jacob, Benjamin and another Aaron) of Meijer David Wolff and Mietje Levie. 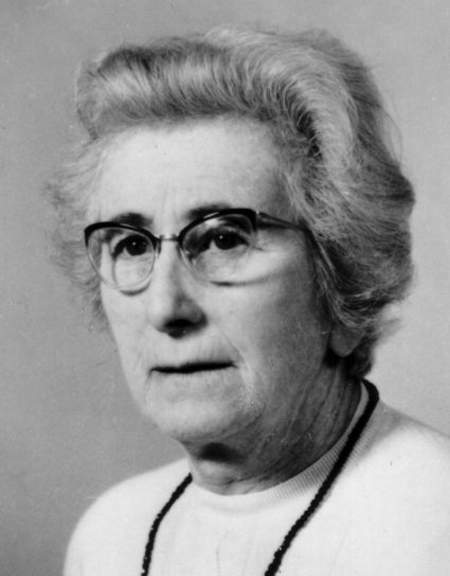 In 1919 he married in Hoogeveen school teacher Hendrika David van der Horst, who was born in Hoogeveen in 1897 as a daughter of David van der Horst and Betje Meijer van Zuiden. 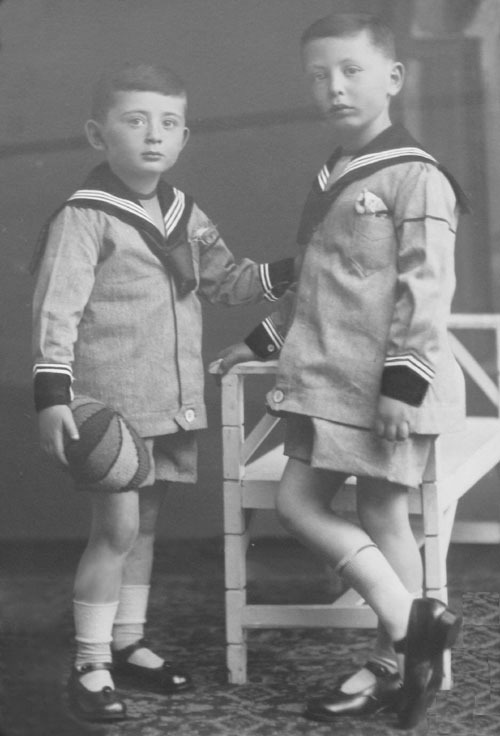 They had two sons; Martin Daan (born in 1920) and Bernhard Jacob (born in 1921). Martin Daan (left) and Bernhard Jacob Wolff. 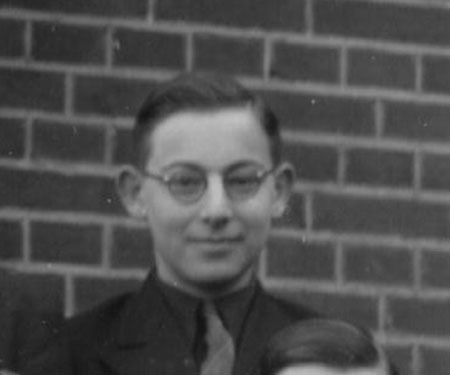 Bernhard Jacob Wolff in 1938. Martin Daan, who was called Martijn, attended the Rijks HBS (a state grammar school) in the years before WWII and was a member of the social club of the students called VESTER. On 15 December 1935 he played a part in the play Het Nieuwe Systeem, which was performed in theatre Ogterop on the occasion of the 20th anniversary of this club.Benjamin Stern was in charge of the ball after the performance. 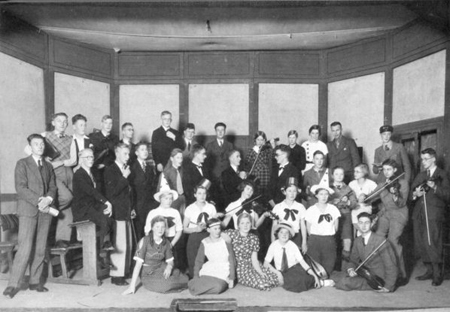 Martin Wolff (top row, on the right, in a cap) during a performance by VESTER, the social club of the students of the Rijks HBS. 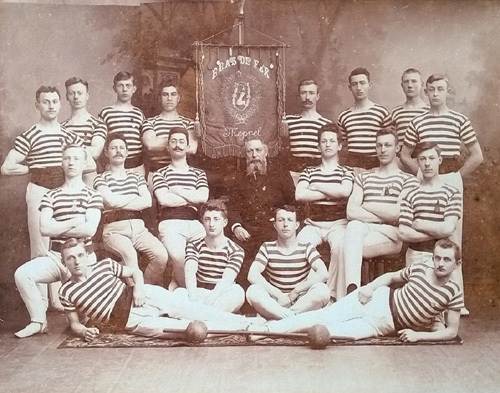 David Wollf, sitting next to the banner, 3rd from the left. David was later one of the best gymnasts of Bras de Fèr, a gymnastic club. 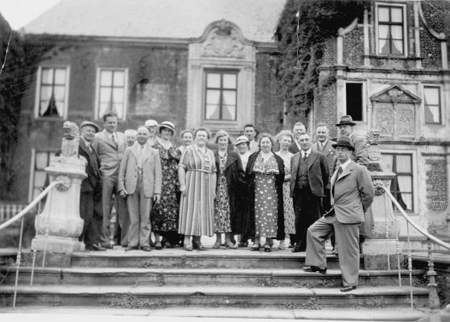 David Wolff, to the right in front in a black hat, during a trip of the Odd Fellows in the thirties, in front of Cannenburgh castle at Vaassen. The wallpaper shop passed into the hands of David when his father died in 1930. He was nicknamed ‘Paperwolff’ to distinguish him from the other Wolffs living in Meppel. It was only a small business, with two men assisting him. One of them was Willem Scheper, nicknamed ‘Frederik Fluweel’ (Fred Velvet). The war started terribly for the couple. 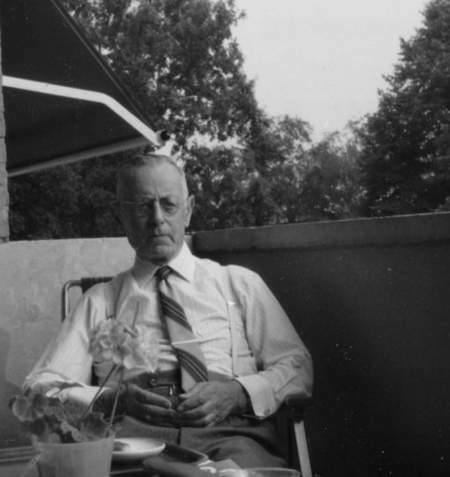 David van der Horst, Hendrika’s father, committed suicide on 19 May 1940. He was one of the Jews who did not expect any good to come of the German occupation. Not much later they received another blow. Bernhard, who worked as a typist for Meppel local council, was dismissed because he was a Jew. Their neighbours in Emmastraat still remembered a few things from the WWII period (Martijn lived no longer at home then). Next to the Cohen-van Esso family lived the Wolff family. They never went to the synagogue and were angry with the Cohen family. Neither of the families had an alleyway, so my father agreed with Bep that in case of danger the Wolff family was allowed to bring furniture and other goods via the garden of the Cohens to our house. Our house and especially the attic was often a store room full of Bep’s evening dresses and fur coats and furniture and cooker of the Wolff family. Bernhard Wolff (left) and Eddy Roos. Mr Wolff’s accounting was so complicated that the Verwalter did not quite understand how it worked, so Mr. Wolff got one day leave a week to do the accounts. The last time he did not go back to Orvelte. Every week my mother baked bread and rye bread for him to take with him to Orvelte. That evening Mr. Wolff came to tell us that she did not have to do that any longer, because the Germans just confiscated it. By the end of September Mr. and Mrs. Wolff decided not to wait any longer for things to happen but to go into hiding. They took the Stars of David from their coats, took the train to Amsterdam and went into hiding with a school friend of Mrs. Wolff’s and her family, the Slaats family on the Molenweg at Amstelveen. Mr. Slaats was a ship broker there. It was a semi detached with a door connecting the two houses, very useful in case of danger. Mr. Slaats’ sister lived in the other house. Fortunately there never was a house search. That morning, when my father drew the curtains, he saw a coal cooker, furniture, lamps and boxes full of tinned food and clothes in our garden. At 07.00 my parents, my grandmother and my sister and I were hastily trying to get all these things inside, before the employees of Brocades started work or to prevent the other neighbours from seeing it. At half past eight it was all inside. At eight my father went to his office at the Landbouwbank. At half past eight Mr. Saljé, a friend of the Wolffs, who lived on Leonard Springerlaan, came to tell us that the Wolff’s house was locked. We were sure they had gone .When we came home from school my mother told us to shut up about all this. At half past one some twenty Germans were in our back garden. We had to line up against the shed and they asked us if we knew the whereabouts of our neighbours. Fortunately, they had not told us, so we could not give any information. Mr. Lakke, owner of a hardware store, saw them take the first train to Amsterdam at 06.00, but always kept silent about it. A few months later my parents got a letter from Amsterdam. Throughout the war Mrs. Wolff sent letters to us, through the ship broker’s office of Mr. Slaats. My father sent by the barge of the Landbouwbank, navigated by Chris de Jong, goods, potatoes, tinned vegetables, rice, oat meal etc. to Amsterdam, where Mr. Slaats collected it. 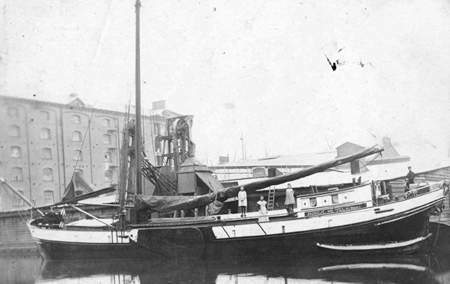 The barge ‘Annigje’ from Meppel, owned by captain P. van Veen, with on deck the Van Veen family, fetched Hendrika and David Wolff from Amsterdam immediately after the liberation of The Netherlands. They had been in hiding in Amstelveen with the Slaats family. Mr. and Mrs. Wolff were brought back to Meppel in my parents’ ship called ‘Annigje’, a 154 ton clipper. In Amsterdam my father got into contact with Mr. Slaats, who asked him to take the Wolff family to Mepel. There was no other means of transport then. My father agreed and also took a boy with them to Meppel. I remember sleeping with Mrs. Wolff in a box bed, while Mr. Wolff slept in the hold, as we had no cargo. There was no wind during those one and a half days, so we had to attach our sailing ship to a barge of a friend of my father’s that had a motor and thus we sailed across the IJsselmeer to Meppel .I talked a lot with Mrs. Wolff, who was a nice and witty woman. Mr. Wolff often joined my father in the wheelhouse. They were terribly sad about the loss of their two boys, who had been killed. After the war, when my parents had bought a neglected little house on Gasgracht, they gave all that was needed to restore it. As the house of the Wolffs had been confiscated by the German army, their movables were listed and also confiscated. On 26 September, their house was confiscated by the Weermacht, but the birds had flown! Mr. Weber took care that the house brought in money. Some Jewish property was not compensated, as in this case, where it was considered part of the wallpaper business and ‘[…] no longer ought to be considered Jewish property’. Mr. Weber, who was at first Verwalter of the firm, was appointed Liquidationstreuhänder on 1 May 1943. Apparently they realized that the business could not be saved anyway. The firm was liquidated on 15 April 1944. Mr. and Mrs. Wolff survived the war, but their sons Bernhard and Martijn were killed. Bernhard died in Auschwitz on 30 April 1943 and Martijn in Gleiwitz on 25 January 1945. We know that Martijn was taken to Westerbork in August 1944, after he had been betrayed by a landwachter for ten guilders. He managed to throw a note from the train with the words: ‘Luchies [his neighbour, TR], going to Westerbork, Martin. Not much later, he was probably taken to Auschwitz on the last transport from Westerbork, on 3 September, together with 1018 other Jews. 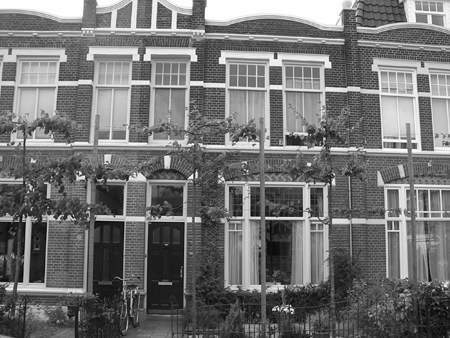 After their arrival in Meppel, David and Hendrika went to live in their home on Emmastraat. David took up his old trade, a wholesaler of wallpaper. They were no longer happy in their house, as it had too many memories of their sons. After the war, David once said to a fellow member of the Odd Fellows: ‘No, I am not going to Germany. The barbarians who live there have killed my two sons.’ They moved to Knopperslaan, where they had a house built. In the fifties the business was sold to Mr. Drupsteen. The Wolff family moved to the Rozenhof at Epe in the early sixties. Recently it appeared that Mr. Wolff had rented a safe at one of the Meppel banks. By order of the Germans it was opened in 1942 and the contents- securities, jewels and other valuable objects- disappeared without a trace. house at Epe after the war.